We had such a great turn out at our last concert, it's time to do it again! Join us at the City of Kenmore’s Summer Concert Series on Thursday, July 21 from 6 – 8 p.m. at Saint Edward State Park. LoveBomb Go-Go Marching Band is taking over the stage. 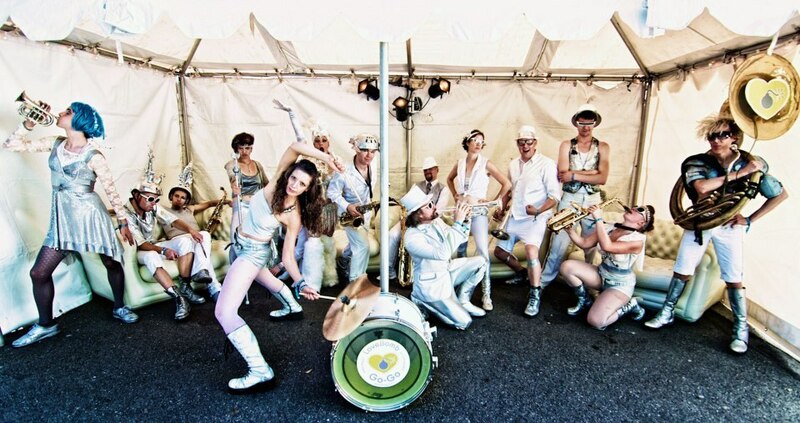 Clad in silver and white, LoveBomb Go-Go Marching Band of Portland, Oregon is a group like no other! With an intergalactic indie-Balkan-funk-punk esthetic, they march into venues delivering a blistering, histrionic-drenched, horn, drum and vocal barrage of all original music. After three great years as a band, they had the honor to perform for 13,000 at the World Naked Bike Ride as well as playing at Folklife and Bumbershoot Festivals, Seattle’s most popular festivals. For more information, visit www.lovebombgogo.com. The 14th annual Kenmore Summer Concert Series offers music on Thursday evenings from 6 – 8 p.m. at Saint Edward State Park, 14445 Juanita Drive NE. Concertgoers are invited to bring blankets, lawn chairs and picnic dinners to share a special summer night. Athena’s, Tacos La Flaca, Cat House Pizza, and Chillz food trucks will be on-site. Hosted by the City of Kenmore, each Thursday night features a different music genre listed above. Admission and parking are free! Washington State Discover Pass is not required starting at 4:30 p.m. For more information, visit www.kenmorewa.gov/events. The City would like to thank the many local businesses for sponsoring the annual Summer Concert Series, including: Frank Lumber, Bastyr University, BowWow Fun Towne, Buyers Choice, Cooley Smiles, Fazzari Marketing, Kenmore Grocery Outlet, Kenmore Camera, Kenmore Pediatric Dentistry, Northshore Utility District, Patrick Fitzgerald State Farm Agency, Puget Sound Energy Republic Services, Snapdoodle Toys, Wells Fargo, 91.3 KBCS, and Saint Edward State Park.